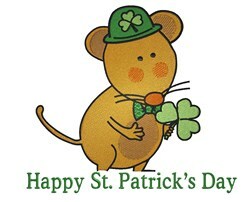 This cute little mouse is all dressed up and ready for St. Patrick's Day! Stitch this onto a child's tee for a fun look! King Graphics is happy to present St. Patricks Day Mouse machine embroidery design which has 23017 stitches and is [142.24 mm x 127.00 mm] large. If you would like to view more embroidery patterns please search on our embroidery designs page.